Ok, folks, a classic thread, but fun nonetheless. Let's hear your favorite experiences of MMORPGs past. What made that day so special? What was so great you will never forget? I'll start us off with one of -- the very first -- of mine. This is a favorable memory though it might not sound like it. It's a fond memory because it was my introduction to an entirely different world. A world that didn't make immediate or intuitive sense--in short, a world of mystery and intrigue. A world of magic. A world I would return to again and again in later years. Now, I knew it wasn't a Black Isle Studios game, so I probably wasn't going to like it too much, but I decided to take the plunge and buy it. As a lover of epic fantasy and a great consumer of trade paperbacks, I had really only one choice at startup. I would be a Wizard and the race that looked best at being Wizards were the Eruites. I made my choices, gave him a generic fantasy sounding name, and logged in. Immediately I was in this strange place of wispy blue figures running too and fro and gigantic marble structures I had to weave in and out of to make sense of anything. I wandered around and talked to some NPCs and waited for the game to "start". I explored a little, fell and died, and had all this confusing stuff pop up on the screen. I could see other players talking so I finally worked up the courage to ask how to get out of the city. A couple people answered but I didn't really understand and I felt stupid asking for clarification. Next day. I decided to give up on my Eruite Wizard. That area was clearly for expert players. I decided to make a simpler Halfling Rogue and boom, again, I was whisked off to a beautiful, immediately engrossing and immersive, village. The layout of this one was much more like the "villages" I'd grown up in so I was able to find my way through cobblestone streets and thatched roof houses. I killed some spiders and there was another player offering to buy their parts so I collected a bunch of them for him, sent him a tell, met him and made some good coin. I was proud. It was real interaction with another player and it felt great. I felt like was contributing and participating in a living breathing fantasy world. Well, I never really advanced beyond those spiders. Unfortunately, I ran into a strange fellow in the village called The Priest of Discord. Now, a young man, I had of course read and been enamored with Robert Anton Wilson's Illuminatus Trilogy and frankly, if a Priest of Discord asked me to do just about anything I would have at that point. I thought whatever geniuses had programmed Everquest must share my love for Eris, Kallisti, the Sacred Chao, and all things Discordia. So I said yes to everything he asked. When the spiders were no longer giving me experience, I went looking for other things to kill and found some other players hunting bigger things together. I thought it looked fun and asked to join but they kept ignoring me or giving me strange replies. Finally, I ran into one player who was willing to explain things to me. He told me that I was a PVP player and no one wanted to group with me because they thought I was going to kill them. I said it wasn't my intent, how did it happen. Then I learned what the Priest of Discord was really about. I went back to him but there was no turning back (though later they added the ability to get your book back and disable pvp). So, I quit and sold my copy to a friend who played it forever and stopped talking to all real life friends because he was always busy "waiting" to raid. It may sound like a strange memory, but I was never angry or disappointed. The world was magical and the experience was my own. The box was just an entry pass, not a storybook game in the tradition I had previously been exposed to. My time outside the game was all spent thinking "what if..." "what if..." and that's the magic that brought me back to it later and to many many many other games. Thinking about the experiences we might have if we built our character this way, thinking about how things might play out if we did this or that, it's imaginative and wonderful. I was, and am, hooked. Around the same time frame, high speed internet finally came around to our new neighborhood. We just moved in here and were excited to finally get it. My hubby and I had always been gamers and had talked about seeing what these new fangled online games were all about. I think that we also were in a CompUSA and sitting there were two boxes---EQ and Asheron's Call. 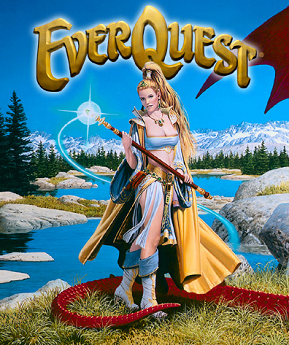 By this time, I had heard some stories about EQ and remember the sales clerk calling it Evercrack. We picked up Asheron's Call instead and were prompty hooked. I remember portalling in (purple swirling thing) and being amazed seeing other players running around. I was so clueless and remember one player just standing there asking me if I needed help with anything. I didn't even know how to reply and he ran off probably thinking I was afk. For a long time, I just ran around the countryside killing bunny rabbits and other small critters before I worked up the bravery to tackle anything else. Asheron's Call 1 was really my fondest memory of an MMO. Good times indeed. Thanks for sharing and for starting this thread. I really enjoyed your story and I'm admittedly a little jealous of the immersion you felt. I don't know if it's age, personality, or what, but I just could never get engaged in the world like that. Don't get me wrong - I had a lot of fun in a lot of MMOs but I never spent a whole lot of time in that dumbfounded wonder I keep hearing about. Although I will say the first time I jumped on a Griffon in World of Warcraft and flew across a brief span of the ocean I almost peed myself but those moments are unfortunately few and far between. However, my hands-down best MMO experienced spanned about six months of arguably the best and most hilariously tragic part of my life. I worked as a manager at a computer store, which was pretty phenomenal considering I was 17 and making more money than at least one of my high school teachers. I did, however, work way too often and it wore me out. The level of responsibility and confrontations with aggressive, angry customers put me in a state of minor depression. This kind of served as a catalyst to spend a hell of a lot more time in front of a computer and a lot less going out with friends, dating, etc which I did prior to the job. Anyways, at one point a friend told me about a somewhat local cyber cafe. That's a store that offers a LAN party where you pay for mountain dew and time on the computer, for those of you that were born when CRT monitors were awesome. We went, and I ended up having a great time. One of the co-owners turned out to be a really cool guy and we were buddies pretty quick. We played Starcraft, Warcraft (the RTS), and a lot of other games but no MMORPGs. The place was usually packed at night, and it was kind of like the Cheers for nerds. Everyone knows your name and there's always something. D&D, Gaming, or smoking and drinking outside. Then Ultima Online came out. I spent the next six months, side by side with one of my new best friends living and breathing this game. That and a lot of underage drinking (he was legal, I wasn't), sleeping in the back room on cots, and watching horrible movies like Dolemite, and walking across the street to pick up McDonalds breakfast after staying up all night. We built up a massive pvp guild on the Atlantic server and had half a year of MMO fun. One night, John Romero (Wolfenstein / Doom / Quake lead designer) and a bunch of big boys in the gaming world showed up because E3 was in town and they heard there was a cyber cafe down the road. The best part? My buddy deathmatched Romero in Quake and absolutely ruined him. Eventually it was back to the real world, my friend and I lost touch for a while, and I got a "real" job. Years passed and I was in Blockbuster looking at games and I heard my name called from behind me. We play WoW together to this day. Last edited by Homebrew; 10-05-2011 at 11:22 AM. I'm gonna post another one, just so people don't think this is limited to first experiences. I'm hoping to hear people's favorite MMORPG experiences, from whatever stage in their career. Anyway, at Star Wars Galaxies launch, I happened to have a lot of free time on my hands, and ran into another player playing around the same insane hours as me and so we quickly shot to the top of the curve in Bio-Engineering (me) and Tailoring (him). We were able to capitalize on this and I made a ton selling rancors (which by the way were so fun to make because you had to extract the samples in a highly dangerous area, running about knowing you could get or 1 or 2-shotted easily) and he made a ton selling whatever clothes he did. Nothing like success and money to find friends you never knew about. Before we knew it, we were in with all the elite and glitz, having friends, discount rates, and various barter systems worked out with all the other high end trade spheres. Got ours houses and bedecked them and all we ridiculously wealthy people set about launching our own little player town to the public. So, we threw a big party and I decided to use the SWG macro system to write a play. SWG allowed you to load macros from a text file, so I created two text files of /1, /2, /3, etc for my friend and I. Then we would load the macros in and just hit the emotes with appropriate timing and sequence to put on the play. The /# commands held all the appropriate gestures and words. We held a mock rehearsal in my house and then put in on. I'd like to say it was brilliant, but it wasn't. At the time I was obsessed with avant-garde theatre and writing these really intentionally abstract and obtuse muddles of confusion. It was strange, surreal, and a little depressing. However, amazingly, it was greeted with applause and compliments. I think most people were just glad to have something, play-like, put on--as it gave the whole affair an air of class. Well, it was a great memory for me. I love the things that can be accomplished socially in these games and player cities and events always have a lot of potential for fond memory making. Haha, I showed my wife how to use the griffons in EQ2, went back to my computer, looked over like 20 minutes later and she was STILL riding them back and forth, a picture of sheer delight painted across her face. I always like to tell people about the adventures of Kungas and Boulderac. In DAOC my friend played Kungas the Norse Warrior, and I player Boulderac the Troll Shaman and we always ran together in Molvik. I healed him when he needed it and he made sure that anything that touched me died. One of my favorites was one day where we jumped on to Molvik to see what was going on and it turned out that the Mids (our side) were laying siege to the center keep. We love a good siege so off we went. We come strolling through the hole and check it out. Hibs in the keep, Mids in the wall towers. No one on the ram.... Kungas runs up to the ram while I take cover in a tower that has LOS on him, he cries out 'Cry Havoc and let slip the Dogs of War!' (that was our guild) and proceeds to start beating down the keep door. Now I'm not ****ting you when I say the hibs hit him with everything they had, magic, mushrooms, arrows, Assassin PA's. I mean his character was rocking non stop from the damage. To explain how he managed this, I'll start off with reminding you that he's a tank. I think we capped him at 2400 HP so he was just soaking this damage up. On top of that his suit was geared for molvik and we had all of his resist capped. furthermore he had dumped a lot of realm points into anti-magic resist which acted as a secondary buffer in combination with the suit. Plus the tanks had just received some much needed love in the last patch and one perk was even more natural magic resistance. On the melee end, well, he stole a keep door from the Kobolds and was using that for a shield. I mean he blocked probably 2/3 of everything coming in at him. With all that in mind healing him was pretty easy. Back to the story, he stood there for about 2 minutes straight taking all this abuse while knocking down their door. Other people would run out to him promising to get his back and each time they were almost insta killed by the shrooms (casters aren't so magic resistant). By the 4th time the healers threatened to stop rezzing people who ran out there. As soon as that door broke Kungas was immediately inside leading the charge up the stairs. When he got in the Lord room He got hit with another barrage of magic but it wasn't even a tenth of what he took outside. There were only a couple hibs left, turned out the rest logged off. They were quickly dispatched and we claimed the keep. That day was forever known as the day Kungas made the Hibs log! For me it is the murloc sound. Upon first-hearing I was immediately afflicted with liquid sino-nasal spewment disorder. After that it was quickly added to the anwering machine. Soon my wife and I were making it in public, and once it was even used with great effect to induce a cashier to process my return. It is the only thing I miss about wow. Mrwrwrmuawaagaaaaaaaaahhhhglgrlglg! Yeah, there's still something exciting about a crowded starting zone. Everyone running around in their cloth undergarments whacking the same weak creatures with their bare hands. Ooo, this bunny dropped a knife; now I am an ASSASSIN, ahahah! and once it was even used with great effect to induce a cashier to process my return. Love the stories, keep 'em coming. It's nice to see nice positive threads and some take me back down memory lane. Another highlight for me in Asheron's Call was when I got my house. They slowly started introducing housing into the game. I forget what you needed to buy them---a writ and some item off a critter. The problem was that no one really knew until the settlement opened turning things into a land rush. Now the world of Asheron's Call was HUGE lending itself to exploration and finding out of the way places. When I stumbled across my little housing development, I fell in love with a little cottage on the side of a hill. I tucked away the location for when they actually opened up this housing area and would check back every day to see if it had opened yet. Fortunately I was on vacation when my little housing developement finally did open and was able to purchase my small cottage. Many people didn't know about this far away place either since it took a few days for houses to be gone (they were very limited). In those days, they hadn't introduced apartments yet so houses were hard to come back. It was also nice to have a secure trading place, otherwise trading was accomplished by dropping something on the ground, quickly logging off and logging on another character to grab it up. Housing and their limited storage chests took care of that little problem. When I was finally able to buy it, I quickly decorated, invited my vassal in to use it as storage and made it as cozy as possible. My husband still remembers the flaming dagger I had over the front door. Such an old game but many good memories. Since I'm on a housing roll, another great game for me was Horizons (now Istaria I think). You had to craft your house and could place items like sidewalks, trees, fences, etc. All these items were crafted and it took a really long time to completely finish your plot of land. When I finally finished everything, I had a house warming party and invited my guild over. We had fireworks and celebrations. I really did love crafting in that game. It was also nice to have a secure trading place, otherwise trading was accomplished by dropping something on the ground, quickly logging off and logging on another character to grab it up. I certainly understand the frustration of needing people to safely transfer items between characters and can appreciate the mail system or shared banks, but there were some nice notions of trust and community fostered by having to use other players. You were pretty brave to drop and relog, hehe. One thing I love in games is when certain areas overlap to create unintended consequences and rather than fixing it, the game embraces it and it becomes its own thing. Anarchy Online, for those who don't know, launched with a vision of using dynamic zoning to allow all players to play on one single server. No longer would you have to coordinate with your friends what server you were on, or find out a real life acquaintance played the same game, but be on different servers and never really get to interact with each other. To facilitate this, Anarchy Online dynamically created new instances of zones whenever a large enough number of players were in the same zone and another tried to enter. There was still no maximum size, if people were in the same group they would go to the same instance of the zone as the other members; but if you were ungrouped, you could spawn a new instance. The Queen of all loot was the magnificent dragon Tarasque. I remember an 18 hour spawn timer, but I just looked at it says 9 so maybe they changed it at some point, and highly rare and coveted loot. Especially because the loot was tradeable and sold very well on the market, it was of interest to anyone even if they weren't the primary user (usually Martial Artist or Enforcer). To make matters more exciting, it was in a PVP zone. In Anarchy Online you can "save" your character for a certain amount of credits (gold). When you die, you lose all your experience since you last saved. In PVP, all items you looted between saving and dying were lootable by your opponent. Finally, the loot system, like many old games, was the group with the highest damage had priority, then after a short amount of time anyone could loot. Finally, if no one looted, everything would disappear. As you can imagine, all these things combined to make one of the most exciting raids in the game. If you focused only on the dragon, the other side would kill you. If you focused only on the other side, you wouldn't get initial loot rights. Even if you did get loot rights, you could get killed before making it to a save point and lose one of the rarest multi-million credit items to a GANKER. And to top all this off, if you crammed enough people into the zone, you could do it again. As more people came to the raid, people would try to enter unteamed to pop the later instances, numbered numerically. While the other instances only popped when a certain population was present, they all had their own independent spawn timers too. So you'd try to keep getting people to come while you killed the dragon in 1, then used the grouping technique to move everyone to 2, then to 3, etc. Usually factions had their own point bots to handle the raid and one of my great memories comes form when I got loot rights on a solo kill. Usually we set up one damage team to get loot rights and everyone else did not group. It helped pop zones and kept people honest. But the damage team must have been too preoccupied with PvP, or I suspect not all present, and I got rights solo (I was playing a heavy DPS class and the tank at least *was* present). Of course, what dropped but, the rarest piece of the dragon armor. I'd killed this thing so many times and never even heard of it dropping. I would have done a backflip, but I might have accidentally let go of the loot window. By this point the damage party was screaming about not having loot and the entire raid was screaming about who had it, and NINJAs left and right. Because no one was grouped you couldn't see what anyone looted so no one knew if it was looted or not. You couldn't add someone to your group to confer retroactive loot rights and if you dropped the window it would be free for all. And rest assured there were ninjas from both factions ready. Well, there was only one thing to do. I /told the raid leader I had it and they auctioned it for the bot points as usual and I looted it and gave it to the winner. Afterwards I got random tells from people telling me how crazy I was, that they totally would have just kept it. It was definitely worth more credits than I ever saw in 3 years of playing that game. But I felt good. Honestly, if I got loot and there was nothing -- which did happen in those days -- people would have accused me of ninjaing. And I probably wouldn't have said anything to begin with. But luckily there was loot and it was really good, and it gave me a chance to prove myself as honest rather than be falsely accused of being not. Seems like a no brainer. But it was a great peak experience. There's a lot of grinding in these games -- I'd killed that dragon countless times -- but sometimes it serves to enable that one day, that one time, where it's really quite a unique and unrepeatable experience. There've been some good ones over the years. I remember finding out of the way places to do all the transactions between characters. Primative but fun. My hubby learned a lesson the hard way. We found a nice town where we tended to put down roots. He would go to the top floor of an inn to do his transferring, against my warnings. One morning as he logged on, he did his drops and relogged to find some other person picking everything up. He got into a huge discussion with this other player who explained that he was teaching him a lesson. He got everything back but this other player sure laid into him. I had some similar experiences with other player picking up gold and whatnot in one of my more remote locations. The MMO communities back then seemed to be a bit smaller and more closely knit. Yes, a lesson was taught but you usually got your stuff back. Killing a Leet in AO and having it tell me it would get on its main and come back to find me. Using Levitate spell in old EQ and climbing the walls of this long, deep canyon and sailing over peoples heads as they walked on the trail below and telling them I had a secret flight spell. Having someone hostile burst into my shop in UO and feeding them a deadly poison kryss. Marking about 10 runes around an orc fort in UO and then popping in and out as I harassed a band of PKs for about half an hour. "I'll get my main!" Haha, classic. Really I could fill pages with great AO memories. I remember farming missions with a fixer friend of mine for stim kits (like health potions). Basically there were no alchemists back then and the best kits had to be farmed from the dynamically generated mission treasure chests. Most people didn't do them because there was honestly no reward (xp, etc) and you had to kill a ton of at-level mobs and there were better kits easily obtainable in the Shadowlands. Unfortunately, the Shadowlands kits didn't work on the planet's surface where all the PvP took place. So if you wanted a little survivability in PvP -- and it was actually very little, like a 20% heal on a 20-30s timer -- you had to farm these. One day, weekend, week, my friend and I were bored and we both loved PvP so we just ran tons of them. We used fixer run speed buff and I mezzed everything that aggroed. He had the BnE to disarm the traps and open the chests. We could run like 6 every 5 minutes. Was great. But the best part was all our guildees telling us how crazy we were. Somehow being told we were crazy and wasting time made it that much more fun. Great feeling of camaraderie. Then Alien Invasion came out and everyone had to run missions for CRU (Controller Recompiler Units). The whole expansion was built around Alien Invasions, but you could only spawn them when your Controller was maxxed out. When it first came out they were super rare drops on the final bosses, but my friend and I already had the best system worked out (best type of missions to roll, get them in the same location, fixer run speed + mezzing aggro). We blitzed so many units that our guild could pop invasions almost non-stop from launch. Then finally everyone had to admit that our mission running talents were not a waste. Perfectly vindicating! Anyway, that was part of the reason why Rift caught my eye. The Rifts and Invasions reminded me of that magic. I'm glad they are starting to get more popular again with the Inscribed changes. And I'd LOVE LOVE LOVE -- please be listening Trion -- if in the future we can ride a rift tear back to one of the elemental planes for additional experience, loot, and fun. There are so many places they could go from here. I hope Trion can build on them to create some truly fun and dynamic content. I think my fondest memory was duoing Zul Gurub and mining the ore that turns you hostile to your friends. Not knowing what skills the AI would use, at the ready to counter whatever was thrown at you when you are met with 'Basic Camp Fire'. Hysterics.